When asked about the Karnataka chief minister's comment last month that Amit Shah is a Jain, the BJP chief said, "I am not a Jain, but a Hindu Vaishnav." 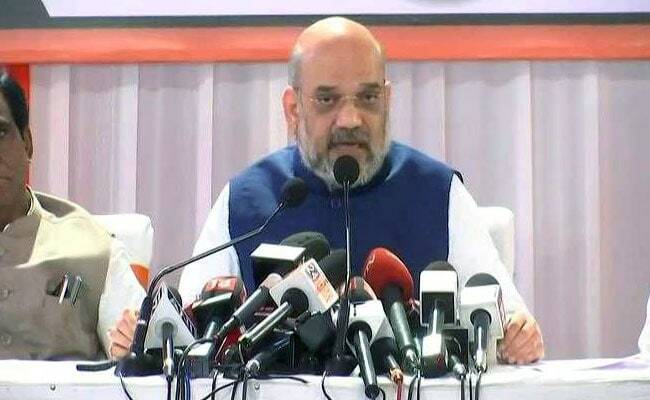 Mumbai: Amit Shah today said he is a "Hindu Vaishnav", refuting Karnataka Chief Minister Siddaramaiah's claim that the BJP chief is a Jain. Mr Shah, while speaking to the media after a rally to mark the BJP's 38th foundation day, also said, "I maintain that the Karnataka government's move to give Lingayats a separate religion status is a move to divide the Hindus." "The UPA government had rejected the recommendation (to give Lingayats the status of a minority group) in 2013. The present decision has only been taken to stop Yeddyurappa from becoming the CM. This is an election gimmick," Mr Shah said. When asked about the Karnataka chief minister's comment last month that Mr Shah is a Jain, the BJP chief said, "I am not a Jain, but a Hindu Vaishnav." Responding to Mr Shah's barb that Siddaramaiah is not an 'AHINDA' (a Kannada acronym for minorities, backward classes and Dalits) leader but 'AHINDU' (non-Hindu) leader, the Karnataka chief minister had said last month in Mysuru that Mr Shah should first clarify whether he himself is "a Hindu or not". "Amit Shah is a Jain. He needs to clarify first whether he is a Hindu. Jain is a separate religion. How can he talk about me like that," Mr Siddaramaiah had said. Ahead of the assembly elections, the Congress government in Karnataka on March 19 decided to recommend to the Centre that Lingayats and Veerashaiva Lingayats should get the status of religious minority.